Soap & Glory Terrific Trio! I know that Soap & Glory always seem to have a 3-for-2 offer on in Boots, but when I passed through Liverpool Street Station today and saw the promotion running it reminded me of three (coincidentally!) products that I have been using on a very regular basis recently. 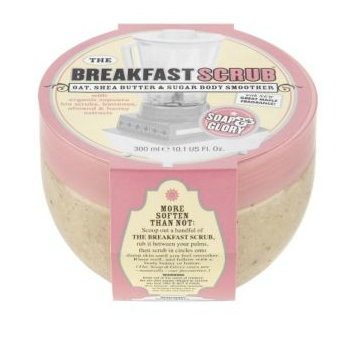 The first is ‘The Breakfast Scrub’, which is a thick, sticky body exfoliator that smells exactly like maple syrup. I happen to love maple syrup, you may not; regardless, the scrub has a great consistency that doesn’t slip off the skin and plonk straight down onto the shower tray in great big clods! I like it a lot and yesterday it won a big beauty award from Cosmopolitan so I can’t be the only one! It’s £9.45 for 200ml. Secondly, I have been working my way through a huge bottle of ‘The Righteous Butter’ body lotion. Again, a very distinctive smell that some may find overpowering, but it’s a very good softener and you get a whopping 500ml in the pump-action bottle! Because it’s so easy to use (no lids to take off with greasy hands, no cap to twist or tube to squeeze) it’s seeing a lot of action. Great value at £10 if you’re a Soap & Glory addict! It has sold out online but I saw it instore at Boots today.. The third and final product is ‘The Firminator’. Originally plucked from the shelves thanks to its amusing name, I have been massaging this ‘anti-cellulite’ gel in to thighs and bottom for a few months, on and off. As with all anti-cellulite potions, it’s impossible to tell the effectiveness unless you use one and one only over a number of months (years!) but I do think that regular daily massage in problematic areas improves skin tone and circulation. 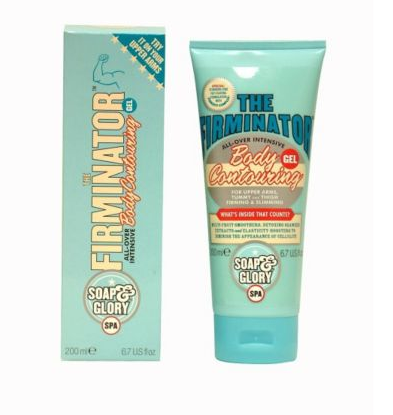 The Firminator is cool and tingly and zingy so great as a morning pick-me-up. It’s a veritable bargain compared to most contouring treatments I use, coming in at just £10.47! Soap & Glory ‘3 for 2’ offer at Boots – browse the products here: http://tinyurl.com/6jxm765 or at any Boots store.